Now that's how you do television. Seriously, I was like shouting through the whole episode. It was almost nonstop action and STUFF HAPPENED. I'm glad the show has introduced another black character but did they HAVE to kill off the other prisoner immediately? Seriously, show at least try a little harder. In any case, Tyreese is apparently a favorite from the comics, so I'm glad he showed up and his little group could be good for #TeamPrison. I mean they left all the weakest behind it seems....plus I really liked the way he respected Carl and accepted his terms for the moment. But they were crazy to carry that zombified lady around with them. I was laughing at Carol with that other prisoner dude (lol I don't know their names) when he said she was a lesbian. BUT. I'm a little eh about the idea of Beth as a love interest for these grown men. I mean TWD kind of telegraphs things, so having him take an interest in her and then the way they showed her kissing Rick on the cheek in the preview...IDK. 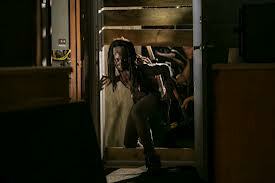 MICHONNE!!! She is just the best. I love that she went to finish off the Governor on her own terms. That fight between them had me gasping and shouting. It was seriously tense and I had no idea what was going to happen. I LOVE that she killed off Penny. I love that his wall of zombie head smashed and I love that she stabbed his eye. When he was trying to move her arm towards that snapping head, I just..wow. This show is the best. Her standoff with Andrea was gut wrenching. It's sad that at the beginning of the season Michonne was staying with Andrea and keeping her alive and all of that is lost. I seriously hope Andrea is rethinking things, though, now that she's seen how crazy the Gov is. Speaking of, I'm guessing the Governor is going to become seriously unhinged now. Which is awesome. He was kind of controlled before but now he's angry and violated etc. (I do kind of wish Michonne could have killed him tho) So like I remember hearing about the fights the Governor had from the comics and when they came on the show I thought they were tame. I'm guessing they change now and Merle and Daryl will be the first to experience that? Daryl's not going to die right? Yay you guys! This episode was so exciting and fun. Also, I read this thing on TWOP about how TWD is the new Lost...and I kind of see where they're coming from? A lot of their reasons were stupid and annoying, but the relationships of the survivors do give me a Lost-feel. Also, the two groups, Woodbury kind of being like the Others (having a civilized life with a crazy leader, etc) works. You know, this is what The Vampire Diaries should have done. Instead of having everything be about saving Elena, they should have bonded the group in a way that felt believable. Sigh. Why am I still talking about that show.